Elastic shoe laces and lock laces have long been a favorite tool used by athletes to improve their running time while also ensuring their safety during training and competition. Elastic and lock laces have also been used by members of the military to ensure that they are not slowed down during a crucial moment. Designed so that shoes remained fastened throughout even the most active of movements, these types of laces are also ideal for use in the home environment. These special stretchy shoelaces are especially easy to use for those with a weak grip or who are unable to reach their feet. 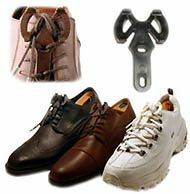 It reduces the burden of tying your shoes to a few simple steps. Insert them into your shoes just like you would normal shoelaces. This process takes a bit of adjusting as you want the elastic to be snug but not too tight where you are unable to put your feet in. After you get the right length, if available, use their spring tension lock on the end of the laces, tie the laces up or cut off what you do not need. This part is probably the longest and most difficult of the whole installation. Ask a friend or a caregiver to help you once and you will not need their help again. Once all the laces are in, insert the ball of your feet and stretch out the width of the shoe. Use something like a long handle like a grabber, shoe horn or a your hands to keep the shoe in place as you push your feet into the shoe. Place your heel and the remainder of your foot. Put your weight on your feet and push in. Repeat for the other foot. You can also use these laces to tie shoelaces with one hand. Kids love these elastic shoe laces too. If you are looking for alternatives to these elastic shoelaces consider Velcro shoe fasteners or extensions, coiled shoe laces, and laces with toggles and springs. People with limited mobility find these types of laces useful as it eliminates the need to bend over or stoop down in crowded or busy areas. 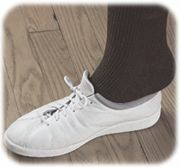 Those who are unable to reach their feet can use long handle shoe horn, a handicap grabber or push your foot into shoes equipped with these elastic laces. Self-fastening laces can ensure that the shoes remain tied at all times, thereby reducing the possibility of accidental falls. This can be especially important for people with disabilities who use access ramps designed for improving building accessibility. 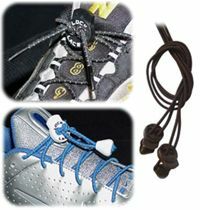 Elastic shoe laces are very inexpensive and typically cost between five and fifteen dollars. 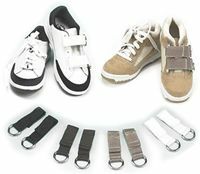 They are available in a wide range of colors and styles that are sure to fit whatever color shoes or sneakers you have. They also come in curly, straight and locked designs to meet the needs of the user. The differences in prices are mostly dependent upon the lace’s unique characteristics and they are incredibly durable, often lasting for the life of the shoe. After the initial lacing, elastic laces require little to no maintenance, thereby making them easy to use. Simply lace them into the shoes and then shoes can be removed and put back on very easily. From athletes, to children, to people with disabilities, elastic shoe laces offer a long lasting and convenient solution to the age old problem of keeping shoes tied.